Water-soluble copolymers of acrylamide (AM) and (3-Acrylamidopropyl) trimethyl ammonium chloride (APTAC) and Na-montmorillonite (Na-MMT) were prepared by controlled radical polymerization of AM, APTAC, and Na-MMT clay using potassium persulfate (KPS) and sodium metabisulfite (MBA) as redox initiator and cobalt acetyl acetone (Co(acac)2) as a catalyst in an aqueous solution. 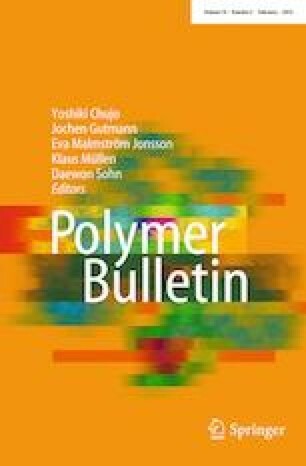 The synthesized PAAM copolymers were characterized by Fourier transform infrared spectroscopy (FTIR), X-ray powder diffraction (XRD), and differential scanning calorimetry (DSC). XRD and FTIR indicated the formation of APTAC/PAAM/Co(acac)2 and PAAM/Na-MMT Co(acac)2 copolymers and also showed that the interplanar spacing increased due to intercalation formation between the clay layers. DSC indicated an increase in the thermal stability of the mentioned hydrogels, and some increases the glass transition temperature of the PAAM hydrogel in the presence of the nanoclay. The Co(acac)2 controlled the chain polymerization via a reversible activation–deactivation of the chains, so the storage modulus of the hydrogel increases significantly. Hydrogels with acceptable gel strength, gelation time, and gel stability were prepared by cross-linking of the aqueous solutions of the synthesized nanocomposite copolymer with Chromium (III) acetate for use in water shutoff operations in oil reservoirs. The effects of pH, salinity, Co(acac)2, temperature, and the presence of clay minerals on the gelation time were investigated, and the activation energies were measured. With increasing temperature, gelation occurred more rapidly. Addition of Co(acac)2 increased the loss and storage modulus, because of reversible activation–deactivation radical polymerization and decreased the gel swelling. The polymer chains diffused between the clay layers so the elastic modulus (G′) of the prepared hydrogels increased, and a reversible interaction between clay and acrylamide chains led to increase in loss modulus (G′′).